October | 2010 | Better days! The girls in their summer clothes … pass me by … I have read that this line is seen as a description of the disillusionment of a man in mid-life, when he still has the desire to charm the girls, but the young ones are not impressed any more (or nobody at all?). But strangely the picture in my own head is that of a very young boy, gathering his courage to go out and do all kinds of wonderful things – and they pass him by. I like the following clip, because it shows his interaction with the crowd so clearly: http://www.youtube.com/watch?v=9sqQKCZlVBg – lots of comments on the site from people who where there, even on that video. Off go the sleepy front porch lights … Just beautiful! And amazing that he can still write about rejection like this, when all of us know what happens when he just as much as sit on a bench at the beach for a little while! Posted on 28/10/2010 by Alta Cloete under Is there anybody out there? I got to know this song from the Barcelona video and after that from YouTube (where I learned to love most songs long before I could acquire the cd’s). I just loved it from the start. The way he just goes wild on the harmonica adds a lot to the power of the song. Of course also the way he still sings it with so much passion after so many years. Video from 1978: http://www.youtube.com/watch?v=7lPzWPXhbVI All of them so young and thin and passionate. Now nobody is young and everybody is not so thin anymore, but the passion is still there. And I think that is essentially what they are about. Paris 1985: http://www.youtube.com/watch?v=XsT2oA4xPiQ Does not seem to have the same power. And the muscles and sweatband don’t really do it for me. But still a beautiful song. Also love the backing vocals. And of course the harmonica. And I wonder how they managed all those cables. Wonderful speech at the end of the video before the next song (My hometown). http://www.youtube.com/watch?v=RsRNqF0CbC8&feature=related Barcelona 2003 – my absolute favourite! In it’s first week of life this blog has given me a lot of pleasure. And I have heard from a wonderful variety of people from various countries. Which made me realize I should maybe add something to this blog as a special gesture of thanks to the troubled country I so dearly love. So from time to time I will share some photographs which have nothing to do with Bruce, but everything with me. Just to show that I do have other interests than The Boss! The photographers are mostly my husband and two sons, while I usually trail behind and take snapshots of them for the family album. Look for the Barcelona video for a powerful performance. 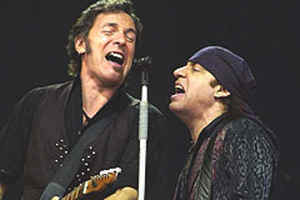 http://www.youtube.com/watch?v=KFAr2AbvvF8 And don’t forget the role of Little Steven. They seem to sing it today with the same passion as more than thirty years ago. Truely inspirational. Of course the badlands can be something else for every person. For me it is the danger of leading a mediocre life without finding and following your true passion, and falling into the dark well of depression. And staying there. 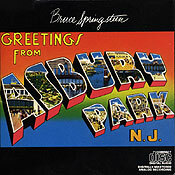 But with Bruce there is always hope to get out again. Posted on 22/10/2010 by Alta Cloete under Is there anybody out there? 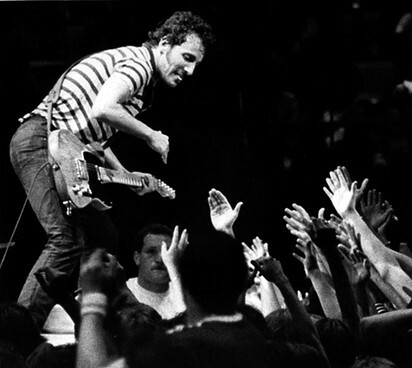 If you still do not know the basic facts of this man’s life, then jump to http://en.wikipedia.org/wiki/Bruce_Springsteen and enjoy the ride! I recently was lucky enough to visit a Springsteen-loving country and acquire an armfull of treasures, of which Darkness was one. And yes – just in time for the release of The Promise! Previously I have only known Badlands, The Promised Land and Darkness on the edge of town (yes, I am a novice, but I am studying hard!). The first two I learned to love from the Barcelona DVD and the second was one of the first songs I got to know through YouTube. 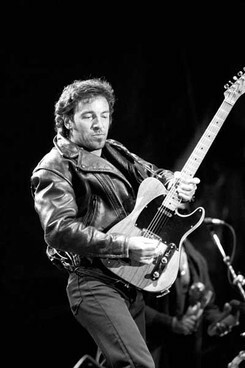 But you do not only see Mr Springsteen Snr walking through the rain, you see millions of workers all over the world walking through all types of weather to all types of unfulfilling, dead end jobs which makes our lives better and more comfortable. This post was written about three years ago. I still feel the same. 🙂 And Bruce is of course now 64 and still going strong. Because he was and still is one of the most attractive men I know about. And yes, of course you can do nothing about the body and face you are born with. But you most certainly can treasure it or ruin it. One can only look at other well known stars of his generation to realize the difference. Nobody can look like that at 61 without embracing a healthy life style. He really is an example for everybody growing older. An no, the above is not the most important reason why I adore (= admire, love, etc. etc. etc.) Bruce Springsteen! It was just the first one to pop into my head when I thought of starting this series of posts. And remember that I am a romance writer – beautiful heroes are my business! Posted on 20/10/2010 by Alta Cloete under Is there anybody out there? I wonder if Bruce has an idea how much his work means to so many people? Yes, I know there have been programs and books about it, but still, does he understand? CAN he understand, not being a fan, but being the man himself? His work just resonates with so many emotions. Today I am crying for my big sister who must say good-bye to the life she has known for 52 yeas. And yes, Real world is playing. Loud. On repeat. At the moment I am constantly listening to this song. 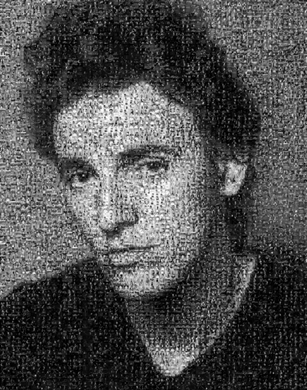 Bruce has succeeded to marry a wonderful melody to lyrics that grabs me by the … OK, I’m a girl … lyrics that means a lot to me. It was all wrong now I’m moving on … How is it possible to convey the same basic message about getting out of a bad situation into a better one in so many new, fresh ways? And keep millions (I’m sure it is not merely thousands) of people listening? … Now I’m heading over the rise … I’m searching for one clear moment of love and truth … Now I have the answer. It’s because the theme is not only relevant to blue-collar workers in America, it is relevant to everybody everywere. And that is why we have kept on listening. My work as writer of romantic fiction deals with a related issue. How to convey the basic story of boy meeting girl (and boy getting stupid, according to House) in ever fresh ways? I did not start out doing it deliberately, but in every story my heroine does not merely meet a wonderful man and then he solves all her problems. (As we know a man cannot do, however hard he may try, however wonderful he may be! ), but she grows in herself and becomes a stronger person. I have actually had my first real press review and the writer has noted that, which is a wonderful inspiration to me. 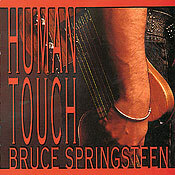 I aquired Human Touch and Lucky Town on a recent trip to Norway. Have never seen them in one of our shops. I am aware that they do not rate that high under Springsteen lovers. Or am I wrong here? 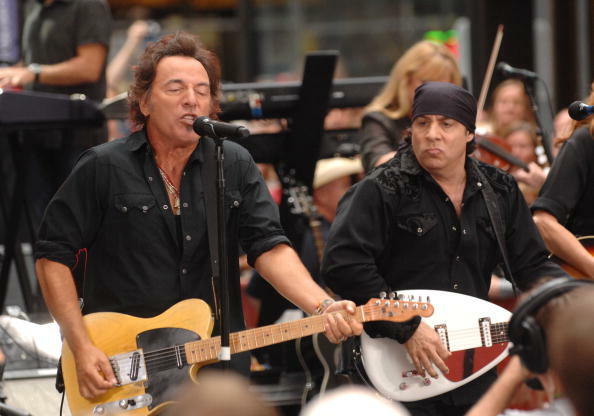 Possibly because he was not working with the E Street Band at that stage. It is also interesting to me that he seems to have acquired a completely new image then, with more emphasis on appearace, hence the naked breast and more distinct outfits. Although he has always been extremely good to look at, the image does not work for me. To me the real Bruce is the one with a plain jean and shirt and hair going wayward. He is not about looks. He is about many, many other things. Passion, hard word, integrity, energy … Allright, I’l stop now. I have decided to start working systematically through all the albums that I have aquired already (about 14 of the how many? 24?). Up to now I have just bought a CD or DVD wherever and whenever the opportunity arrived, and have been listening haphazardly to old and new songs and different styles without really learning enough about the ones that I did not love emmediately (and there are not many of those!). 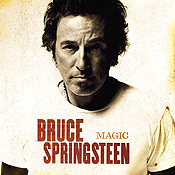 So I’ve taken Greetings from my steadily growing stack of Bruce treasures. Yes, I know that it was a long road to getting the contract and also that he was originally signed on as an acoustic performer, apparently to make him the next Dylan. 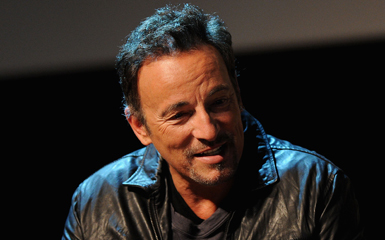 But we know Bruce – he will not be made into anything that he does not want to be. I also know that it was released to much musical acclaim, but not much popular success. I can understand that, because I am also struggling with the music. I cannot begin to describe the music. For one, I do not have enough knowledge of music. But I can certainly appreciate the mass of words that were just pouring out of him. I have heard him saying (On the Storytellers DVD) that that is why he has never been into drugs – there were already going on too much in his head. And isn’t that head still working beautifully nowadays?! So I listen to the images just tumbling out of him and I can picture him, so young and talented and driven. And I can only thank the Lord for an example like that of somebody just blindly persueing his dream, his passion, his sense of what he must do to be a whole person. And I carefully venture further on my own road. PS. And yes, the album is steadily growing on me. Saying good-bye – but NOT farewell! This blog is about two and a half years old now. During these years it has become a part of my life, like Bruce has become a part of my life. The best way to put it is to say that his music fills every empty moment of my life with positive energy. That pretty much sums it up. 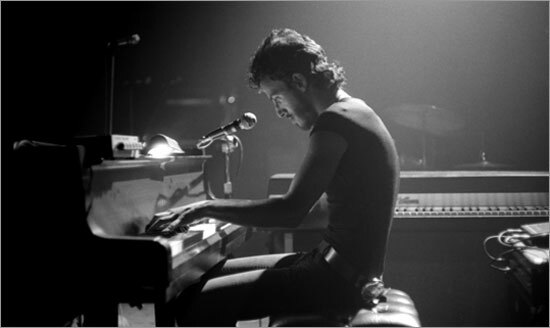 I have, however, come to the point where the urge to talk and write about Bruce is not so unbearably strong any more. Not because I have grown tired of his work, but maybe the honeymoon stage is over now. 🙂 As we all know, true love does (hopefully) not stop after the honeymoon, but continues in a calmer and more mature way. This might be where I am now. I’m not trying to convert those around me anymore. 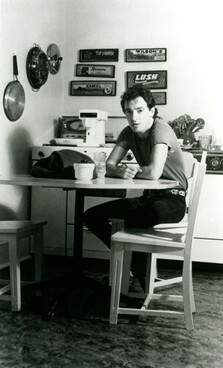 I do not listen to only Springsteen music anymore. I can actually talk about other things, too. But no, I will not leave him behind. He has done too much for me. And will continue doing just that. For the foreseeable future I will repost from this blog for those who were not with me for the entire ride. Hope you enjoy, as I will enjoy looking back.